There are two Cuenca’s in the world, one in Spain and one in Ecuador. Cuenca, Ecuador, shares a lot with its Spanish cultural twin, including art, food, architecture, and religion. Even the fresh trout from the rivers that run through the city, and the affinity for fiestas remind me of Cuenca’s Spanish ties right down to the Picasso influenced murals that line the streets. Cuenca, Ecuador was founded on April 12 1557, and named after Andrés Hurtado de Mendoza, who commissioned the founding and ordered the city named after his home town of Cuenca, Spain. It’s formal name is Santa Ana de los Cuatro Ríos (four rivers) de Cuenca, honoring the four rivers that encase it. Cuenca is widely regarded as the most European city in Ecuador, due to its 16th and 17th century era Spanish colonial architecture resembling cities and architecture throughout Spain. The city was badly destroyed during the Inca civil war in the 1520’s, and was subsequently rebuilt by the Spanish. It’s population and importance grew steadily during the colonial era, and blossomed due to the spring-like weather which provided an abundance of farming opportunities. Following the erection of stunning architectural buildings, and artisans flocking to the city creating a cultural center, the cosmopolitan reputation of Cuenca was firmly established. Ecuador is very diverse, in that it carries many cultures within it. It is not unusual to see shamans, or nuns next to men dressed in hand-tailored suits carrying on business meetings in the chic restaurants that line the cobblestone streets. It is easy to detail the history of Cuenca by the mix of faces in the crowd. Indigenous people still wear their native costumes, right alongside Spanish descendants wearing Catholic school uniforms. 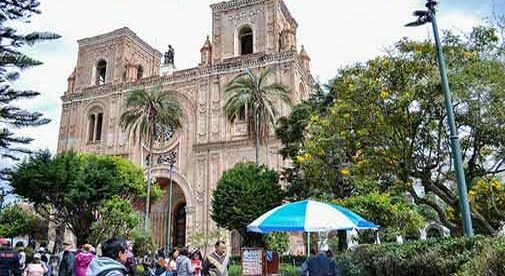 Add to the mix expats making Cuenca their home, and tourists from around the world exploring the Inca and Spanish laced culture, and you’ll understand why this city has a cosmopolitan flair. Today, Cuenca has 500,000 urban residents, of which 8,000 are expats. Cuenca also hasn’t been Americanized, and Cuencanians live in a different, slower timeframe, thinking nothing at closing down their store to go to their child’s soccer game. This is a place that hasn’t forgotten it’s priorities. Here you can feast in elegant restaurants serving trout plucked right from the mountain streams, or try a taste of cuy (guinea pig) served right off the grill at a sidewalk café. This collision of cultures is what gives Cuenca it’s ambiance. You also have options in terms of shopping, from modern supermarkets that rival Walmart, to indigenous markets with aisles of fresh fruits and vegetables in unusual shapes and colors, along with stacks of freshly caught tilapia and bowls of gigantic shrimp. I personally like to buy liter bags full of golf-ball sized strawberries carted around in wheelbarrows by vendors who sell them for $1 a bag, or grab a fresh cup of coconut water from a woman wielding a machete who hacks open the coconut for 50 cents. Having lived in flat Florida most of my life, I delight that Cuenca is located in the highlands of Ecuador at about 8,200 feet above sea level, and only a 20-minute ride to the Cajas Mountains, where I caught a five-pound rainbow trout on my second cast off at a mountain stream. For those of us who have settled here, there is a secret desire to keep Cuenca undiscovered, because once you find it, you’re likely to stay.